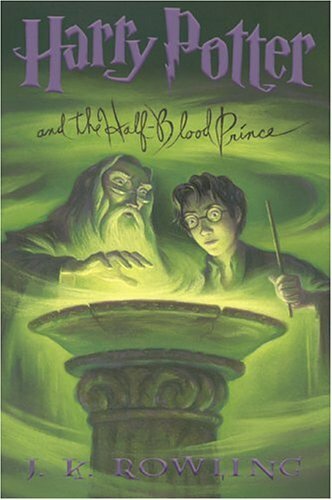 Okay: for all of you who have finished Harry Potter and the Half-Blood Prince (and if not, what are you waiting for? 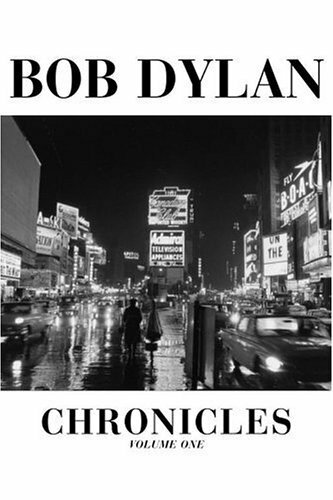 ), here is a site that fleshes out conclusions that I had come to when I read the end of the book. As the URL itself is something of a spoiler, I won't list it here, but only click here if you don't want the end of the book ruined! In one of my courses, I teach about globalization, based largely on Tom Friedman's excellent overview The Lexus And The Olive Tree. 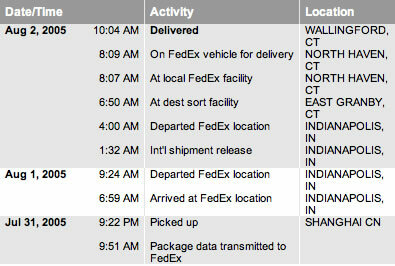 The arrival of my new iBook today illustrates just how amazing the system is: I ordered a built-to-order laptop last week on the Apple online store, on Sunday night this machine left the factory in Shanghai(! 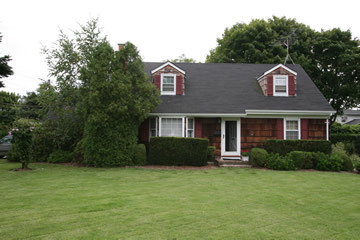 ), and on Tuesday morning I am writing my first blog entry on it here in Connecticut. "You have no messages in your mailbox." I NEVER hear that enough! Telephone calls and e-mail messages have slowed to a trickle. I will enjoy a few more weeks of this! I've just downloaded Skype. I am now ready to explore the strange new world of internet telephony, so if anyone reading this wants to help me try it out, let me know. August 8th again already, huh?! 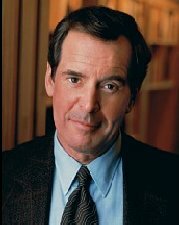 I was saddened last night to hear of the death of Peter Jennings, the ABC News anchor whom I got to know a little when I was his son's adviser at school. While I have not been a regular viewer of evening news programs, Peter always seemed to come across as a classy and sincere presence, both on the air and in person. This sad event, combined with the recent retirements of Tom Brokaw and Dan Rather, really changes the paradigm for network evening news broadcasts. How odd to have three torches passed in such a short time. Off this morning to Montreal for a couple of days. I plan to catch some of the Masters Series tennis while up there. I know, they haven't called this tournament "the Canadian Open" for the better part of two decades, but that's still how I think of it. Montreal and Toronto share hosting duties, with either the men or the women in alternate years. This year the men are in Montreal. I watched Andy Roddick go down in two sets to Frenchman Paul-Henri Mathieu in the featured evening match. Roddick didn't play especially well, but Mathieu was pulling shots out of his derriere. In light of Lleyton Hewitt's pulling out with a stomach ailment earlier in the day, the tourney is now missing two of its top four seeds. Anyone for a Nadal-Agassi final? The age of electronic communications--e-mail, cell phones, IM, VoiceMail, etc.--makes it easier to stay in touch. It was cool to receive birthday wishes from a bunch of Choate students past and present through these different channels. So thanks to the following for dropping me a line: Dane Evans '05, John Gelb '05, Frank Hamilton '06, Khalid Itum '98, Eliot Jia '06, Don Liesemer '95, Justin Murphy '05, Austin Ogilvie '05, Josh Rabjohns '93, and Chris Verrillo '05. The New York Times ran a front page story this morning discussing the City's recommendation that all restaurants cease use of trans fats in their food preparation, comparing trans fatty acids to asbestos! The article can be read here (free registration required). "All Cultures Are Not Equal"
Let's say you are an 18-year-old kid with a really big brain. You're trying to figure out which field of study you should devote your life to, so you can understand the forces that will be shaping history for decades to come. Go into the field that barely exists: cultural geography. Study why and how people cluster, why certain national traits endure over centuries, why certain cultures embrace technology and economic growth and others resist them. This is the line of inquiry that is now impolite to pursue. The gospel of multiculturalism preaches that all groups and cultures are equally wonderful. There are a certain number of close-minded thugs, especially on university campuses, who accuse anybody who asks intelligent questions about groups and enduring traits of being racist or sexist. The economists and scientists tend to assume that material factors drive history - resources and brain chemistry - because that's what they can measure and count. But none of this helps explain a crucial feature of our time: while global economies are converging, cultures are diverging, and the widening cultural differences are leading us into a period of conflict, inequality and segmentation. Not long ago, people said that globalization and the revolution in communications technology would bring us all together. But the opposite is true. People are taking advantage of freedom and technology to create new groups and cultural zones. Old national identities and behavior patterns are proving surprisingly durable. People are moving into self-segregating communities with people like themselves, and building invisible and sometimes visible barriers to keep strangers out. 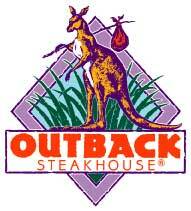 If you look just around the United States you find amazing cultural segmentation. We in America have been "globalized" (meaning economically integrated) for centuries, and yet far from converging into some homogeneous culture, we are actually diverging into lifestyle segments. 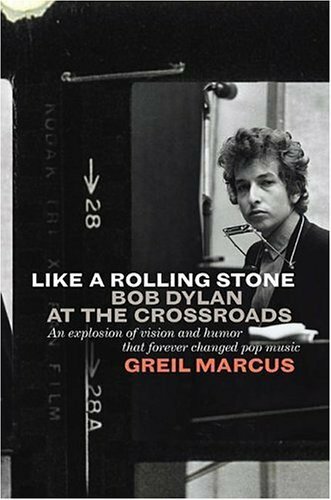 The music, news, magazine and television markets have all segmented, so there are fewer cultural unifiers like Life magazine or Walter Cronkite. Forty-million Americans move every year, and they generally move in with people like themselves, so as the late James Chapin used to say, every place becomes more like itself. Crunchy places like Boulder attract crunchy types and become crunchier. Conservative places like suburban Georgia attract conservatives and become more so. Not long ago, many people worked on farms or in factories, so they had similar lifestyles. But now the economy rewards specialization, so workplaces and lifestyles diverge. The military and civilian cultures diverge. In the political world, Democrats and Republicans seem to live on different planets. Meanwhile, if you look around the world you see how often events are driven by groups that reject the globalized culture. Islamic extremists reject the modern cultures of Europe, and have created a hyperaggressive fantasy version of traditional Islamic purity. In a much different and less violent way, some American Jews have moved to Hebron and become hyper-Zionists. From Africa to Seattle, religiously orthodox students reject what they see as the amoral mainstream culture, and carve out defiant revival movements. From Rome to Oregon, antiglobalization types create their own subcultures. The members of these and many other groups didn't inherit their identities. They took advantage of modernity, affluence and freedom to become practitioners of a do-it-yourself tribalism. They are part of a great reshuffling of identities, and the creation of new, often more rigid groupings. They have the zeal of converts. Meanwhile, transnational dreams like European unification and Arab unity falter, and behavior patterns across nations diverge. For example, fertility rates between countries like the U.S. and Canada are diverging. Work habits between the U.S. and Europe are diverging. Global inequality widens as some nations with certain cultural traits prosper and others with other traits don't. People like Max Weber, Edward Banfield, Samuel Huntington, Lawrence Harrison and Thomas Sowell have given us an inkling of how to think about this stuff, but for the most part, this is open ground. If you are 18 and you've got that big brain, the whole field of cultural geography is waiting for you. Okay, this is hardly an example of "cutting edge" technology, but after looking at this brand new air conditioner sit in its box for the past six weeks, I finally faced up to the installation process and got the thing hooked up in my bedroom window last night. Sleeping just became LOTS more comfortable! This entry really does involve tech at the "cutting edge," unlike my last entry. I loaded an application called DVArchive on my iBook. It finds my ReplayTV unit (it's a DVR like Tivo, for the uninitiated) which is connected to the Internet via an Ethernet cable and then downloads shows of my choosing to the laptop so I can take them with me to watch at my convenience. So here I am on Long Island, watching a program on my iBook that I recorded from HBO earlier in the week. Pretty cool. A few details for those interested in the set-up: (1) DVArchive is platform-neutral, so it's equally appropriate for PCs, Macs, Linux, etc. (2) In order to watch the shows on my computer, I had to download a QuickTime plug-in from Apple (it costs about $20) which enabled playback in MPEG-2 format. 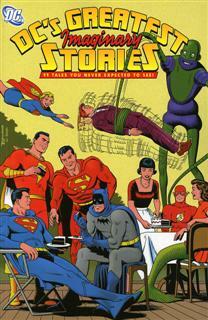 DC Comics just released a trade paperback of "imaginary stories." By that, they mean those stories that fell outside of regular continuity (like Jimmy Olsen marrying Supergirl or Lex Luthor killing Superman). Of course, the title of this collection suggests that the rest of the comics produced in the last sixty-odd years were somehow NOT imaginary! Hmmmmm . . . This application called Comic Life makes it easy to make a comic strip from photos in your iPhoto collection or from images captured on an iSight camera. Check out the trailer here. 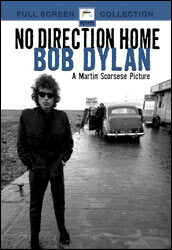 It will be broadcast on PBS and released on DVD in September. Subway Maps To Go, iPodders! If you have one of the color screen iPods that can display photos, you would be foolish not to download subway maps for New York, London, Boston, Montreal, Hong Kong (and plenty more to come, no doubt) by accessing this nifty site. Well, assuming you plan to be in any of therse cities, anyway! As the month of August is a prime planning time for me--what with it being very quiet around here and school starting just a few weeks from now--I've been making a lot of use of an application called NoteBook, developed by a software company called Circus Ponies (click here to check it our for yourself). 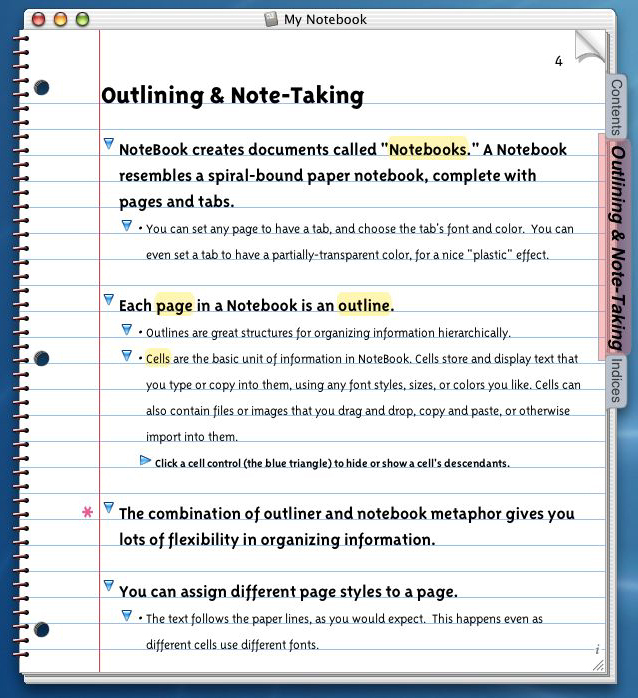 The concept is that you maintain one (or more) virtual "notebooks," which is basically a way collect all sorts of data: text, images, sound recordings, video, electronic documents, URLs for web sites, et al. I have set up a notebook for each of the courses I teach to collect all sorts of materials and notes for my teaching, for example. What's cool about this format is that it's a very intuitive way to collect "clippings" from all sorts of different sources, and then organize them and store them for easy retrieval later on (with all the advantages of electronic search, including Spotlight on OS X). Given that I am something of a media omnivore (I read two newspapers a day, subscribe to WAY too many magazines, and surf the Net incessantly), having the flexibility to squirrel a chuck of information away for later reference is invaluable to me. It's helpful to be able to maintain different notebooks because there are a range of different roles I have to fill in my work (teach, administrator, coach, housemaster). I have found NoteBook especially useful preparation for my writing projects. I also created a "Travel" notebook where I can collect ideas and contact info for the sabbatical trip looming just over a year away. The Tiger OS interface makes it easy to "clip" text, images, media files without leaving the application I am working in, even if NoteBook is inactive or not even open! Once the information is deposited in a notebook, it's automatically indexed and can be highlighted, amended, formatted in all sorts of ways. Enough of my description. If you really want to see how this product works, check out the video demos online here. Finally, you can download the application for a 30-day trial for free and a student or teacher can buy a license for the software for only $30! This would be an INVALUABLE tool for students to learn to use, in my estimation, so if you are going to school, check it out. Q: What's the difference between the Vietnam War and the Iraq War? A: George W. Bush had a plan to get out of the Vietnam War. I.D.�whose central (and easily refuted) talking point is that certain structures of living things are too intricate to have evolved without the intervention of an �intelligent designer� (and You know who You are)�enjoys virtually no scientific support. It is not even a theory, in the scientific sense, because it is untestable and unsupportable by empirical evidence. It is a last-ditch skirmish in a misguided war against reason that cannot be won and, for religion's sake as well as science's, should not be fought. If the President's musings on it were an isolated crotchet, they would hardly be worth noting, let alone getting exercised about. But they're not. They reflect an attitude toward science that has infected every corner of his Administration. From the beginning, the Bush White House has treated science as a nuisance and scientists as an interest group�one that, because it lies outside the governing conservative coalition, need not be indulged. That's why the White House-sometimes in the service of political Christianism or ideological fetishism, more often in obeisance to baser interests like the petroleum, pharmaceutical, and defense industries-has altered, suppressed, or overriden scientific findings on global warming; missile defense; H.I.V./ AIDS; pollution from industrial farming and oil drilling; forest management and endangered species; environmental health, including lead and mercury poisoning in children and safety standards for drinking water; and non-abstinence methods of birth control and sexually-transmitted-disease prevention. It has grossly misled the public on the number of stem-cell lines available for research. It has appointed unqualified ideologues to scientific advisory committees and has forced out scientists who persist in pointing out inconvenient facts. For the entire piece, click here. Person 1: Now you say "control freak who?" Off to Boston tonight, then on a plane at Logan in the morning to head for five days of vacation in Bermuda. I'll be there by lunchtime. I should be able to post while I am there, but if this space seems out-of-date, you'll know why. Congratulations to Williams College for (again) landing in the #1 slot in the annual U.S. News & World Report rankings of the best colleges in the country. Of course, while I usually regard such rankings as nonsense, in this case I can confirm the validity of the magazine's conclusion. I am spending the night in Boston, right in Logan Airport at the Embassy Suites. It's a great hotel: all the rooms are actual suites, you get a full cooked breakfast included with the room, and each room has high-speed wireless Internet access without a surcharge. And I found a deal on the Web for all of this for about $125. This is my second trip to Boston in the last few weeks, and both visits have been nostalgic for me. I used to live 20 minutes north of the city and would come in at least once a week. I'd typically park in Cambridge, right on the Harvard campus, and take the "T" all over. Even after moving to Connecticut in 1987 I visited Boston regularly through the mid-1990s--at least a few times a year--but I haven't spent a lot of time up here in recent years. So it's been fun to reconnect. I finally broke down and picked up the "stick of gum" iPod, to be used while working out. Gotta have every toy, I guess! I am happy Bill Maher's show is back on HBO after his hiatus, too. Best line of the night: teaching "intelligent design" on the same footing as evolution in public schools is like medical schools treating the stork delivery explanation of childbirth as a viable alternate theory. Well, I wasn't surprised to see Safin lose to Ginepri yesterday. I watched a lot of the match and it's hard to believe the Russian is the same guy who handled Federer so capably in the Aussie Open semi in January. Safin can be brilliant, but he is SO inconsistent. The other three players I mentioned a few blog entries ago all advanced. The Hewitt/Roddick match later today could be a great one; I sense there's not a lot of love lost between these two. 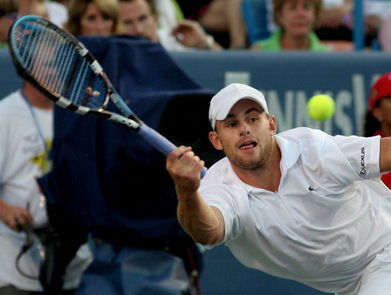 Roddick will need to serve well if he wants to avenge his loss to Hewitt in Melbourne. Hopefully the place I'm staying in Bermuda will have ESPN2! Okay, I am off to the airport. I arrived in Bermuda a short while ago. The island is beautiful: the first thing a visitor sees is sparkling clear bright blue water next to the airport. It's quite hot here, without being stifling. The flight down was a breeze. We were in the air not much more than 90 minutes, I think. I had a row of seats to myself, so there was plenty of space to stretch out a bit. The journey was made easier by my recent acquisition of the Bose QuietComfort 2 headphones, which effectively cancel the background rumble of the jet. While they are pricey, the sound quality is excellent. 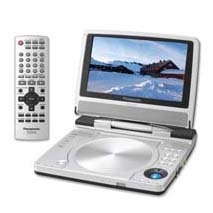 The other new toy I put through its paces on the plane was my portable DVD player: the Panasonic LS-55. It boasts 10+ hours of play on a single battery charge, which is enough to watch the entire Lord of the Rings trilogy on a long intercontinental flight! I am about to head out to rent a scooter for the length of my stay here, as it's the most practical way to get around. More about Bermuda later. Andy Roddick prevailed in a tight 6-4, 7-6 victory over Lleyton Hewitt in the second semifinal of the ATP Masters Series event in Cincinnati. The Australian dominated the rivalry before today, winning six of seven and the last three encounters, including a big showdown in the Australian Open semis in January. So when Roddick clinched the win this evening, he was visibly pumped. Next up for Andy is Roger Federer, who prevailed in a closer-than-expected three-setter over Robby Ginepri. I watched the semis this afternoon and this evening on ESPN Deportes, the Latin American version of the cable network. Curiously, the matches were broadcast with English commentary, though with different analysts than ESPN uses back in the States. • The first thing I saw on the television in Bermuda when I settled into my place was a James Bond movie: Sean Connery in You Only Live Twice, to be specific. A little later yesterday afternoon, Thunderball was playing. Apparently AMC is running a Bond marathon all weekend, which I've been sampling on and off, as the exotic setting here does conjure up a certain Ian Fleming feel! • The scooter is the way to go in terms of getting around down here. Non-natives can't rent cars and while you can do pretty well via bus and ferry service, with the scooter you can make your own schedule. I've thought of getting one of these back home since I was in college. Maybe the gasoline prices of 2005 will make it easier to rationalize such a purchase! • Sundays seem to be very quiet here. Most shops are closed and when I drove (scooted?) to the St. George's end of the island in the morning to do some exploring, there were very few vehicles on the road. 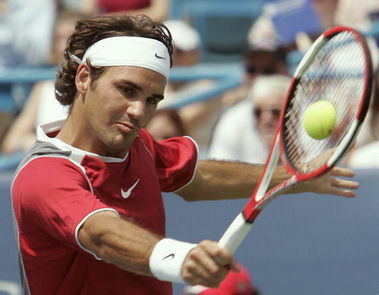 • Roger Federer was impressive coming off a six-week layoff after Wimbledon to beat Andy Roddick today. The Swiss player may just be too good for the American to beat with any consistency. (I got to watch this match on the CBS feed, though it was on ESPN Deportes as well.) Anyone willing to bet against Federer in Flushing Meadows next week? • Since the place I am staying has a full kitchen--it's more like a small apartment than a hotel room--I picked up some salmon burgers to cook. I don't know if these are available back home, but they certainly are good! Female Favorite For The Open? In light of a convincing win over her countrywoman and nemesis Justine Henin-Hardenne and the fact that she has only lost one match all summer on the hardcourt circuit, can anyone doubt that Kim Clijsters is the player to beat in the women's draw at the Open next month? Yeah, I could tell you about it, but just click here and be surprised. Once Ms. Sheehan could no longer be ignored, the Swift Boating began. Character assassination is the Karl Rove tactic of choice, eagerly mimicked by his media surrogates, whenever the White House is confronted by a critic who challenges it on matters of war. The Swift Boating is especially vicious if the critic has more battle scars than a president who connived to serve stateside and a vice president who had "other priorities" during Vietnam. The most prominent smear victims have been Bush political opponents with heroic Vietnam r�sum�s: John McCain, Max Cleland, John Kerry. But the list of past targets stretches from the former counterterrorism czar Richard Clarke to Specialist Thomas Wilson, the grunt who publicly challenged Donald Rumsfeld about inadequately armored vehicles last December. The assault on the whistle-blower Joseph Wilson--the diplomat described by the first President Bush as "courageous" and "a true American hero" for confronting Saddam to save American hostages in 1991--was so toxic it may yet send its perpetrators to jail. True to form, the attack on Cindy Sheehan surfaced early on Fox News, where she was immediately labeled a "crackpot" by Fred Barnes. 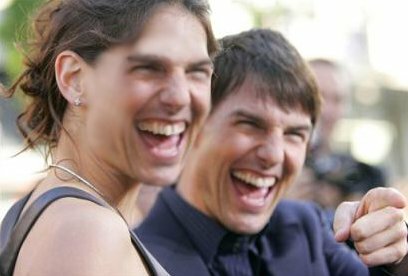 The right-wing blogosphere quickly spread tales of her divorce, her angry Republican in-laws, her supposed political flip-flops, her incendiary sloganeering and her association with known ticket-stub-carrying attendees of Fahrenheit 9/11. Rush Limbaugh went so far as to declare that Ms. Sheehan's "story is nothing more than forged documents--there's nothing about it that's real." But this time the Swift Boating failed, utterly, and that failure is yet another revealing historical marker in this summer's collapse of political support for the Iraq war. Of course, the fact that this commentary appeared in the Times means that, as usual, the President's apologists will dismiss such sentiments as part of the pervasive "liberal media" that supposedly dominates American life (in spite of the considerable evidence to the contrary!). Given that the Mac OS has a market penetration supposedly under 5%, the following data--charting visits to this web site in August 2005 to date--is fascinating. Today was literally a day at the beach. The above picture is of Horseshoe Bay Beach, one of a string of beaches on Bermuda's south shore that I checked out today. As one who frequented the white sands of Long Island's south shore while growing up, I am very picky about my beaches and these are first rate: ample white sand, crystal clear blue water at a perfect temperature, the protection of coral reefs just offshore, and and spectacular scenery all around. 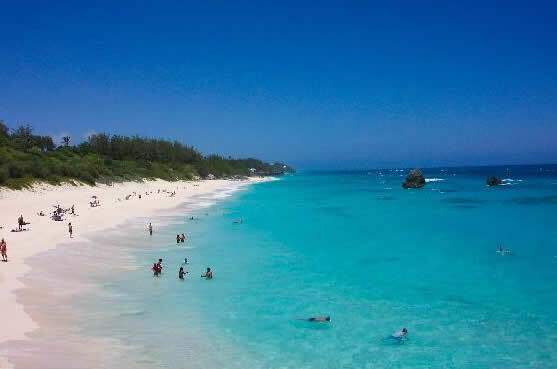 Aside from basking in the solar radiation today, I went into Hamilton for the papers and a haircut in the morning and explored the western half of Bermuda and took a ferry back to the center of the island before hitting the beaches. I am staying in Paget, which is perfectly situated for my needs. A scooter ride into the "city" of Hamilton is less than ten minutes (it's really just a town: the tallest buildings are the huge pair of cruise ships docked on Front Street each day) and the beaches are even closer. Tomorrow afternoon I head back to "the real world," but not before a last session on the beach in the morning. As has been widely reported, Pat Robertson, former Republican candidate for the presidency and self-proclaimed "Christian" leader, publicly called for the assassination of Venezuelan president Chavez on his program The 700 Club. One more illustration of the hypocrisy of Robertson and his ilk: false prophets who cloak themselves in a narrow interpretation of the Christian faith that somehow always seems to line up with the accumulation of wealth, lower taxes, Second Amendment rights, sexism, homophobia, and Bush foreign policy. I might get used to Logan Airport. My flight back up from Bermuda was great: again, I had a three-seat row to myself. The Delta terminal was clean and comfortable and relatively uncrowded. I suppose flying in and out of Boston could cut the better part of an hour out of a transatlantic flight. And it's really not that much farther from Wallingford than the N.Y.C. airports (and the traffic is rarely a problem, especially now that the central artery takes you right from the Mass Pike to Logan). The tennis year doesn't end with the conclusion of the U.S. Open, but the fact that this is the final major of the year means there is a lot at stake for the world's top players. Among the men, three players have a 2005 Grand Slam title already under their belts: Marat Safin (Australian), Rafael Nadal (French), and Roger Federer (Wimbledon). Should either of the latter two prevail in New York, he'll have a convincing case to be considered #1 for the year, as the pair also have split the entire ATP Masters Series titles between them (Safin would have a less compelling argument, in light of his inconsistency). Add into the mix a trio of former U.S. Open champions who play well on DecoTurf II and have reasonable expectations of contending--Andre Agassi, Lleyton Hewitt, and Andy Roddick--and you have the makings of a great tourney. Obviously Federer is the man to beat (and has a great draw) but the Open has produced plenty of surprise results in the past, but it's hard to see anyone outside of these six hoisting the trophy in two weeks time. On the women's side, you again have three champs in the year's previous majors: Serena Williams (Australian), Justine Henin-Hardenne (French), and Venus Williams (Wimbledon). Amazingly, none of these players in among the top four seeds. Also contending in Flushing Meadows are the two who have traded the #1 ranking back-and-forth the past few weeks--Lindsay Davenport and Maria Sharapova--as well as the woman who has dominated the summer hard-court circuit: Kim Clijsters. This draw will be fun to watch unfold. Among the dark horses: #4 seed Amelie Mauresmo (who always seems to fold her tent when deep in the tournament), last year's champion and finalist, Russians Svetlana Kuznetsova and Elena Dementieva, and Mary Pierce, who is enjoying her best year in some time; hard to envision any of this quartet winning, though. 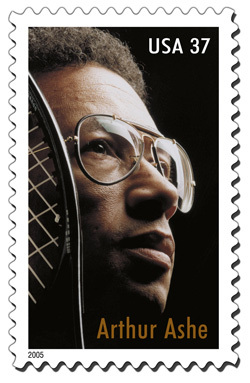 Arthur Ashe has been immortalized in a stamp, one which features the photo of the tennis great that was used for the Sports Illustrated cover when Ashe was named "Sportsman of the Year" in the early 1990s. The stamp was officially unveiled today, when the USTA runs the Arthir Ashe Kids' Day event at the National Tennis Center. I visited my hometown of Bayport, New York for the third time this summer, this time to finish clearing out any childhood possessions I wished to hang on to, for my parents are getting ready to move to a new house in Connecticut in a few weeks. This development is a bit unsettling for me, as that house has always been "home" for me. My folks moved in right before I was born. While it certainly will be nice to have my parents living only thirty minutes away, I'll miss going back to Bayport. Reporters apparently have started asking elected officials who are supporters of the Iraq war if they have encouraged their own children to enlist in the cause. Read about it in "The War Room" at salon.com. The Internet has all kinds of interesting corners to explore. There is a database on this site that contains tens of thousands of comic book covers. The issue pictured above is the very first comic I can remember reading as a 5-year-old in the back seat of the family car. 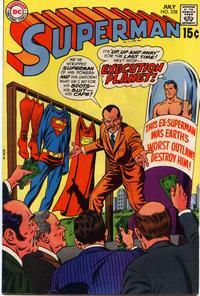 For the record, it's Superman #228 (July 1970). I think this was bought to entertain me when my family was driving south to spend the summer in Guadalajara, Mexico. In light of Andy Roddick crashing out in the first round of the U.S. Open last night, do you think American Express regrets the (admittedly very clever) series of ads based on Andy losing his mojo? Veteran tennis writer Peter Bodo started a blog this year as part of the Tennis magazine website and has a good piece on Andy Roddick's U.S. Open loss here. 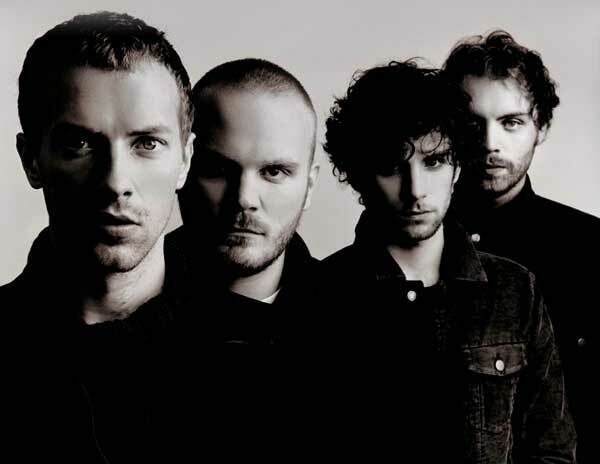 This page contains all entries posted to As Far As You Know in August 2005. They are listed from oldest to newest.